Glutinous Rice Flour Dumplings in Coconut Milk (Krong Krang Nam Ka Ti) - This dessert is very easy. With soft and chewy Krong Krang and sweet coconut milk, sprinkle with roasted white sesame seeds. This dessert is suit for both children. Krong Krang Balls In Coconut Milk - This dessert is very easy. 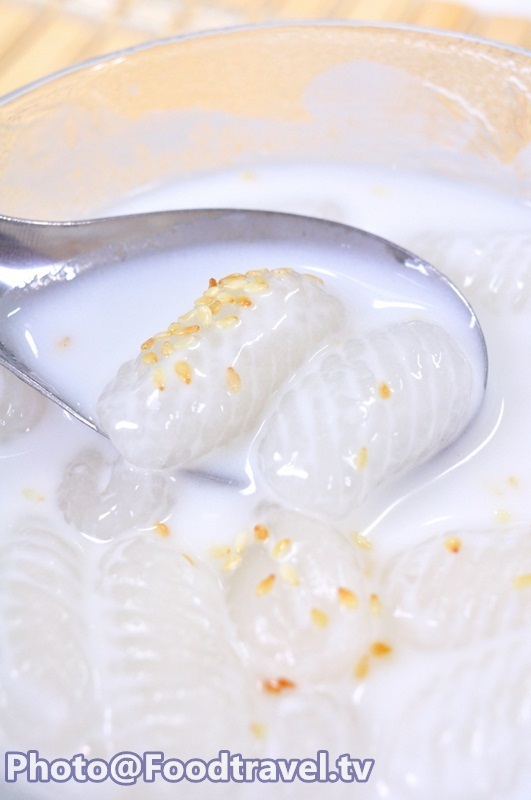 With soft and chewy Krong Krang and sweet coconut milk, sprinkle with roasted white sesame seeds. This dessert is suit for both children. 7. 100 grams Tapioca Flour for apply to your hand and the flour will not stick together. 1. Mix rice flour and tapioca flour together. Add boiled water and use the spatula to mix until the dough is combine well together. 2. Sprinkle flour on a chopping board and your hand. Then knead for 5 minutes until dough is smooth. 3. Cut the dough into small pieces. Knead dough to round shape and not exceed than 2 cm. Then Put in Krong Krang mold. 4. Put the water in the pot to a boil. Boil Krong Krang until cooked. Bring up and set aside in cold water. 5. Boil coconut milk, salt, sugar together until coconut milk start boiling. Put Krong Krang in coconut milk and stir well together, follow with roasted white sesame. Ready to serve.